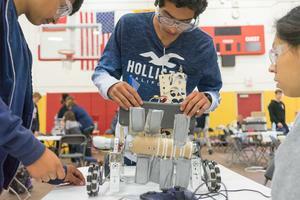 Students competed as part of League B: Compton-Inglewood, which includes 12 high school teams and 2 middle school teams. The Lennox Middle School teams are called “Spicy Bowl of Robots” and “The Tech Bots.” Their season consists of 4 meets with an additional inter-league meet. The Spicy Bowl of Robots, with their consistent performance, has earned them the number 1 ranking! This means that LMS is the winner of their league, and will represent League B as the number one seed as they move into the inter-league playoffs. If they are in the top 4 teams at this upcoming weekend meet, they will move on to the Los Angeles Region Finals. Wish them luck!